I definitely have a love for pretty dishes. My only downfall is that I really don't have a place to display them...no china cupboard, sideboard, etc. All my kitchen cabinets are closed fronts so there is no way to see inside of them (really, a good thing!!). Someday though, I dream of having a china cabinet full of my pretty dishes that are currently packed away. Back when I was in college, I was a designer for Home and Garden Party and as a perk, I was able to purchase alot of really pretty dishes at a discounted price. This was how I managed to fill my hope chest with so much gorgeous pottery and home decorations. Pottery has to be a favorite of mine too...I love how rustic and elegant it looks!! We take our inspiration from the beautiful Winterthur estate located in the Brandywine Valley of Delaware. From 1839, four generations of the du Pont family called Winterthur home. Today the home and gardens are open to the public, who can share the vision of Henry Francis du Pont. The extraordinary museum, garden, and library offer a variety of tours, exhibitions, and programs for all ages. Our goal is to offer beautiful accessories and gifts that remind us of the elegance of Henry du Ponts era, along with modern items that enhance the atmosphere and beauty of your home and garden. Browsing the Winterthur Store's website was certainly fun...I had a VERY difficult time choosing an item to review. They have everything from outdoor accessories and furniture, to dinnerware and bedding! So much to chose from...something for everyone! 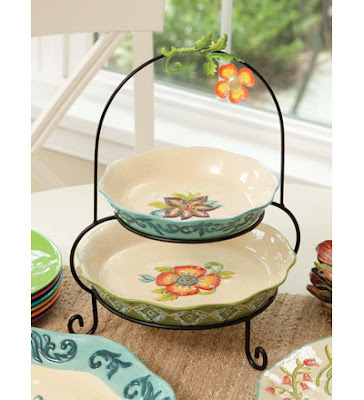 So, for this review I chose to review the Madison's Garden 2-Tiered Ceramic Serving Plate with Stand set. I was really taken in by the colors of this item...it looked really festive, elegant and a perfect addition to any party table! This set is even more gorgeous in person. The dishes themselves are deep enough to hold a good amount of food and each plate has a lovely flower painted in the center. I especially love the outer edges of the plates...they have a beautiful raised design that compliments the plates so well. The edges are also beveled around the top, making them look Victorian. Another elegant touch to this set is the little metal flower attached to the "handle" of the wrought iron stand. It just adds so much flair to the dishes and helps to set off the colors. It is wrapped very securely and so you don't have to worry about bumping it out of place. I love it! So, in my opinion...the Winterthur Store is my type of place! I love the selection, prices and the setup of the website. It is very easy to navigate and provides accurate details about the offered products. My lovely dish set will be a wonderful gift for someone on MY Christmas list and I am very excited to be able to give such a great gift away!! Visit Winterthur Store, then come back here and leave a comment letting me know which product you like the best. :) You do not have to be a blogger to enter, but you must have a valid email where you can be reached should you win. If you do not leave an email address, it must be where I can easily find it. This giveaway is open to US residents (lower 48 states only) and will end 9/26 at 11:59 pm EST. The winner will be chosen using random.org and will be notified by email. The winner will have 48 hours to respond, or another winner will be selected. 1. "Like" Winterthur Store on Facebook. 2 entries, so 2 comments. Disclaimer: I received no monetary compensation for this post. I did receive a free Winterthur Store product for review purposes. All quotes and stock photos are from the Winterthur Store website and email. All thoughts and opinions are 100% mine. i like the Leaf Wall Mirror! thanks. I love the boucle throws in green...so pretty and would look wonderful in our country house. Thanks for the chance to win the cute plates. There are so many beautiful things on there! I really like the different items in the Bird Toile design...the Tea for One, Salt and Pepper shakers, Cake Platters, etc! I like the Calla Lilies Statue. My favorite is the Tuscany Bench. I like the wine thermometer. I love the Brookside Oval Barstools! I love the Metal Lovers Bench. I love the Bird Mirror. I like the Tuscany bench. I already follow with Google Friend Connect (1). I already follow with Google Friend Connect (2). I already follow with Google Friend Connect (3). I love their Calla Lilies Statue, everything is beautiful! Thank you! 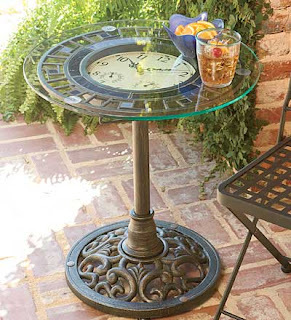 I love the Lincoln Tiered Side Table on their website! Gorgeous! I loved visiting Winterthur when I lived in Pennsylvania as a child, and wish I could visit again! My favorite is the Fairy Night Light. I love the Folk Art Quilt an Pillow-very pretty! I love the Adams Rose dessert plate. It's so beautiful and cheery! I liked the Winterthur store on Facebook! I browsed on their site... I am impressed!!! The prices are very reasonable. This is a " bookmarker" for sure. I love the bird mirror!! I like the one quart pitcher. My mom has something similar that she uses for gravy on the holidays. I use a pyrex measuring cup! Oh so hard to pick one thing I like the rooster wall hanging,the Galileo weather station,the wood frame Galileo, and the Rooster Area Rug!! !